Pioneer Raindrop SS fountain  - HKD688 : PetPetMaMa , The Best Products for our pets! Pet fountains help your animals to drink more water because they are attracted to moving water. In the past the only option you had for an automatic pet fountain was a plastic one. 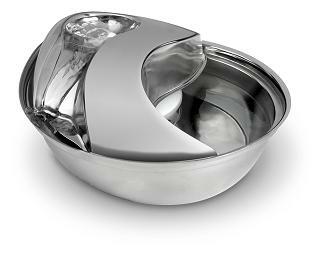 Now finally there is a stainless steel pet drinking fountain that looks like it belongs in your kitchen. Our stainless steel drinking fountain is extremely easy to take a part and clean. There has never been a pet fountain that looks or works as well as this one does.